The Cherry Bundt Cake is a classic German cake recipe.This cake is also called "Rodonkuchen", especially in the Northwest of Germany. Some call it ring cake. 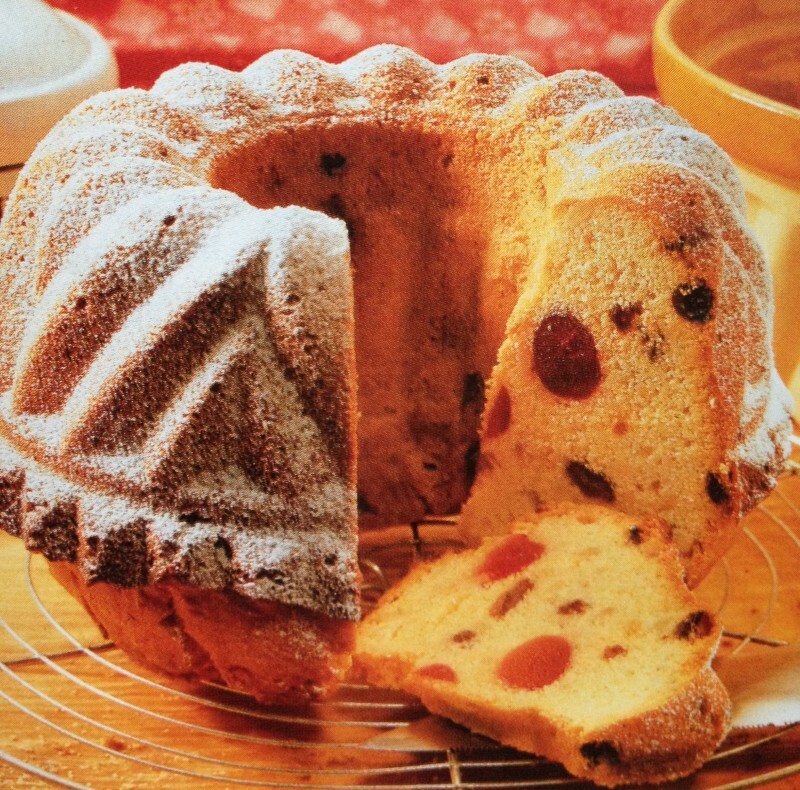 You can use a variety of cherries for this German cake. If you like to add a glaze mix powdered sugar with Kirsch Schnaps and spread it over the cooled off cake surface. Happy Baking! Fresh cherries: wash them, pat dry and remove pits. Sour cherries: drain them thoroughly in a sieve. If you use Morello cherries in liquor don't use the Kirsch schnaps! - Place cherries in a bowl and sprinkle them with Kirsch Schnaps, cover with foil and let soak for 30 min. Drain them in a sieve. - all dough ingredients should be having room temperature. Have them for 30-60 min out of the fridge. - Mix eggs with sugar, salt and vanilla sugar in one direction until foamy. - Add butter bit by bit; butter should be soft and not liquid. - Mix flour with baking powder and sieve it to the dough, spoon by spoon, not at once; add chopped almonds. - Add the cherry kirsch schnaps liquid. - Turn raisins in flour and add to the dough. Gently mix them in, then at the end add the cherries and fold them in with a wooden spoon. - Grease a Bundt cake form and sprinkle with almond flour or bread crumbs. - Bake on pre-heated oven on 175 C or 350 F for 70 min. - When cake is done place it on a baking grid, when cooled off dust it with powdered sugar.